There’s one more Buslee crew member I want to address in this deeper look into their crew photo – Erwin Vernon Foster. 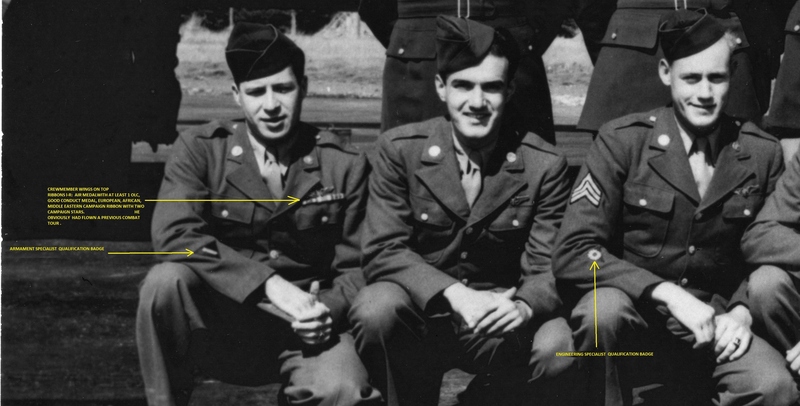 As Keith Ellefson, combat data specialist and NexGen of the 384th Bomb Group, has pointed out, it looks like Foster had flown a previous combat tour before joining the Buslee crew. 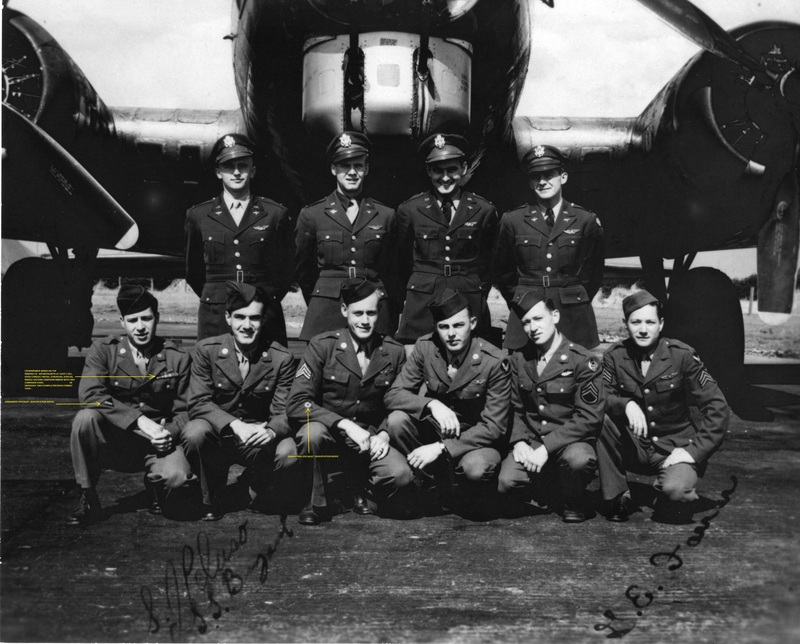 Keith notes that “all of the men in the photo are wearing wings but only Foster has any kind of awards being displayed.” Keith also notes that on his assignment order, Foster was a Corporal. Since Foster had a previous tour, he normally should have been at least a Sergeant, and more likely a Staff Sergeant. This led Keith to believe that Foster had been reduced to Corporal prior to being assigned to the Buslee crew. However, Keith noticed the following decorations worn by Foster. He has his crew member wings on top. Foster’s ribbons represent an Air Medal with at least one Oak Leaf Cluster, a Good Conduct Medal, and European, African, and Middle Eastern Campaign ribbons with two Campaign Stars. He also wears an Armament Specialist Qualification Badge on his right sleeve. Foster was one of only three of the original Buslee crew members to complete his missions without being killed, seriously wounded, or taken prisoner. He went on to fight in the Korean War as evidenced by his tombstone. Like my dad, Erwin Foster only lived to be sixty-one, dying in 1981. A short life of sixty-one years doesn’t seem fair for a man who fought for his country in two tours in WWII and in Korea, does it? 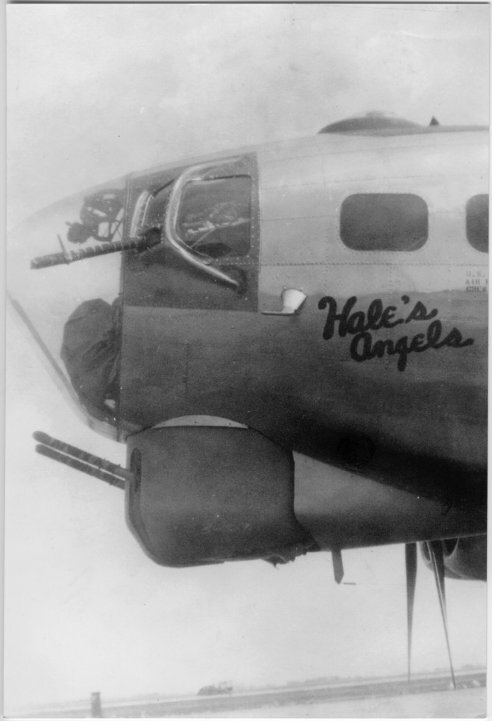 Thank you again, Keith Ellefson, 384th Bomb Group NexGen and combat data specialist for you help in providing me this information. 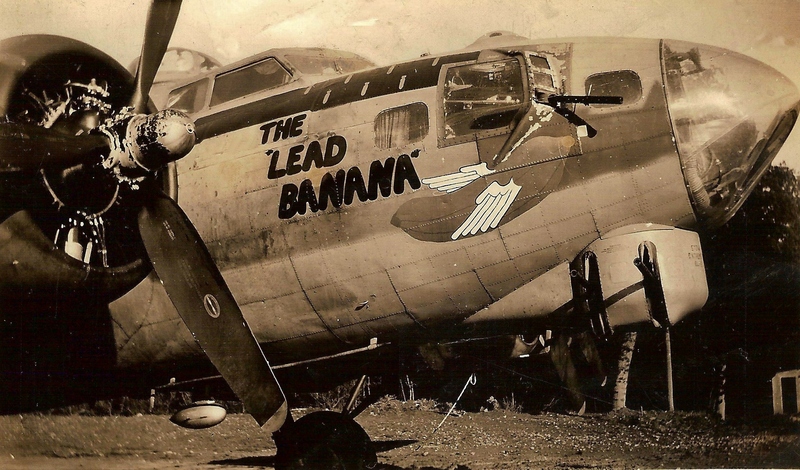 WWII photos courtesy of the 384th Bomb Group. 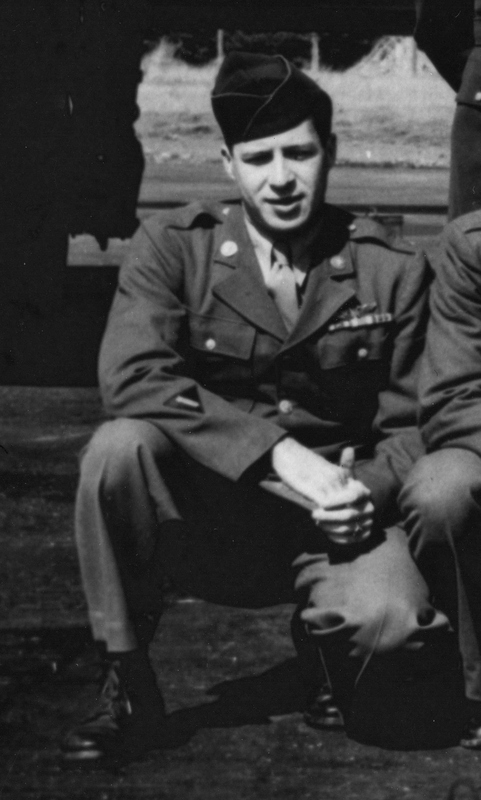 Erwin V. Foster was the original ball turret gunner, also known as the belly gunner, of the John Oliver (Jay) Buslee crew. His first combat mission was mission 171 on August 4, 1944 to a Crossbow (V-Weapons) Rocket Research & Development Complex in Peenemunde, Germany. 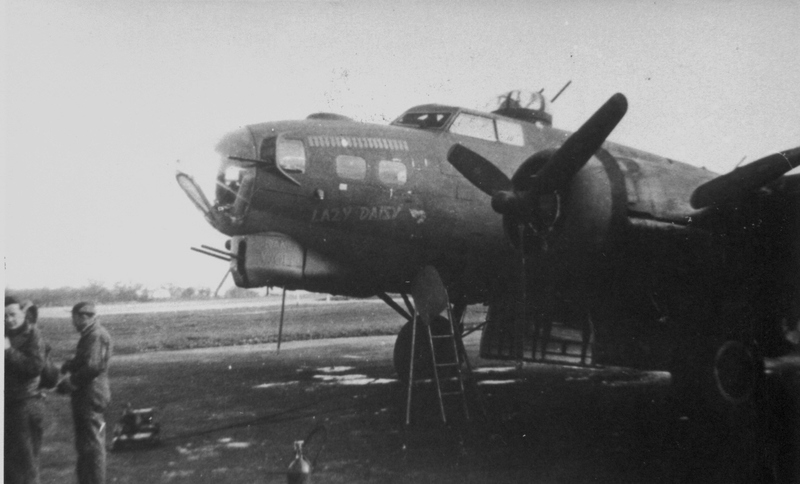 Foster flew eight missions with the Buslee crew and was not on the Lead Banana with his fellow Buslee crewmates when Lazy Daisy collided with it on September 28, 1944. 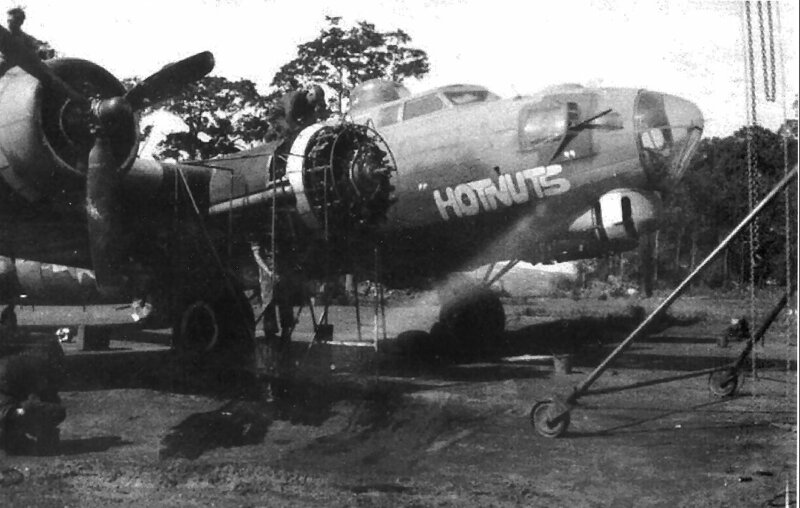 Foster survived thirty-five missions with the 384th, with his last mission on February 28, 1945, mission 277 to the railroad marshalling yards in Hagen, Germany. Erwin Vernon Foster was born on February 12, 1920 to Erwin and Mary Foster. The 1920 Federal census shows Erwin Sr. and Mary Foster living at 421 East Third Street in Corning Ward 1 (Steuben County), New York. Foster, Sr., entered the Navy on July 24, 1918 just a month before his twenty-seventh birthday. He served on the USS Guantanamo from October 9, 1918 until the end of WWI on November 11, 1918. Navy records show that he died on March 10, 1921. It is unclear if he was still serving with the Navy at the time. Erwin Sr.’s parents were Hiram C. Foster (1868 – 1945) and Addie Mae Moore Foster (1869 – 1896). He had a brother named Earl, who was two years older. Erwin Sr.’s death left Erwin Jr.’s mother, Mary C. Foster a young widow with a son who had just turned one year old barely a month before. It must have been a tough time for Mary trying to raise a child alone in the early 1920’s. The 1925 New York state census shows Erwin Jr. living at 169 Horseheads Boulevard in Horseheads (Chemung County), New York with the Horton family. The head of household at the Horton home was Lizzie L. Horton (age 52). Lizzie was living with her son, Charles Horton (age 20) and daughter, Gladys M. Horton (age 16). Also living with them were Erwin V. Foster (age 5) identified as a boarder and Raymond Carpenter (age 8), also identified as a boarder. Mary Foster was not listed as living in the home. In 1930, the Federal census shows Mary Foster (roomer) and Ruth Carpenter (head of household), both widows, living at 401 Elm Street in Elmira (Chemung County), New York. 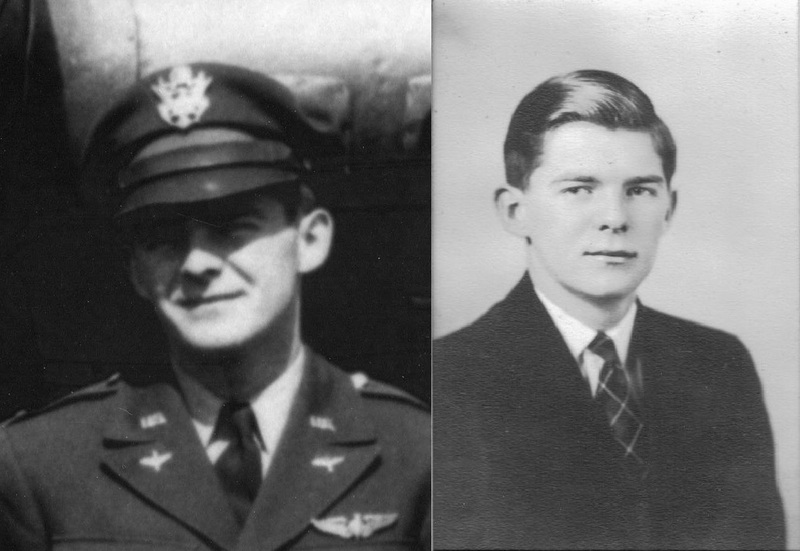 Neither of their sons, Erwin Foster, Jr. or Raymond Carpenter, were listed on the record as living with them. Mary’s occupation was listed as stenographer and Ruth’s was beautician. By the 1940 Federal census, Mary Foster and Ruth Carpenter were still living together, now at 76 York Avenue in Elmira. Ruth’s occupation was still beautician, but Mary was now listed as a clerk for the railroad. Both of their sons were now listed as living with them. Erwin was now 20 years old and a student in his second year of college and Raymond was 23 and a gas station attendant. In 1942, public records listed Erwin Jr. as living at 705 Winsor Avenue in Elmira. 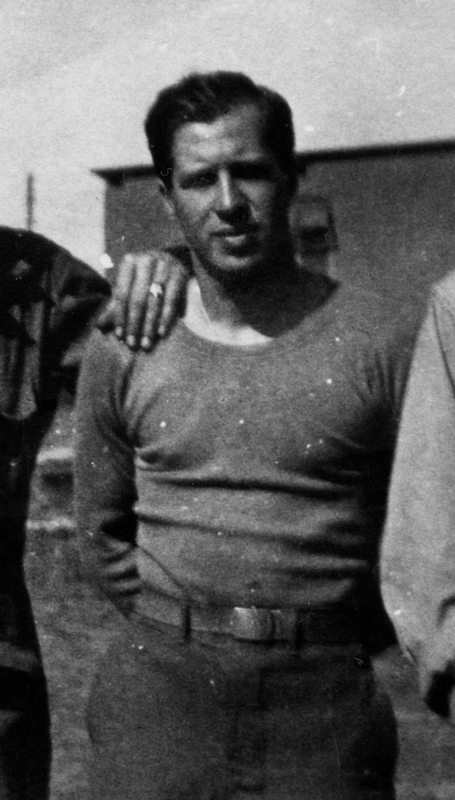 On November 27 he enlisted in the service in Binghamton, New York. His enlistment record indicates he was 5’5′ and 143 pounds. His civilian occupation was listed as “embalmers and undertakers.” He was single with no dependents. 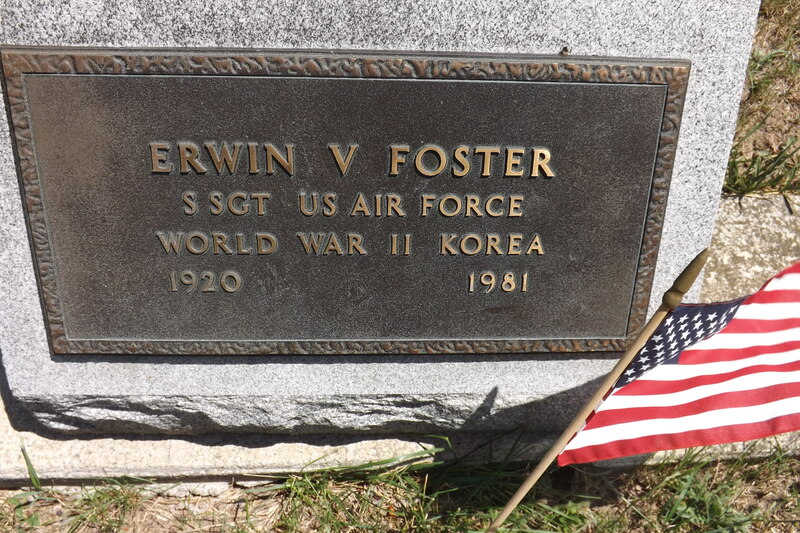 Erwin V. Foster was one of the lucky ones to survive WWII. 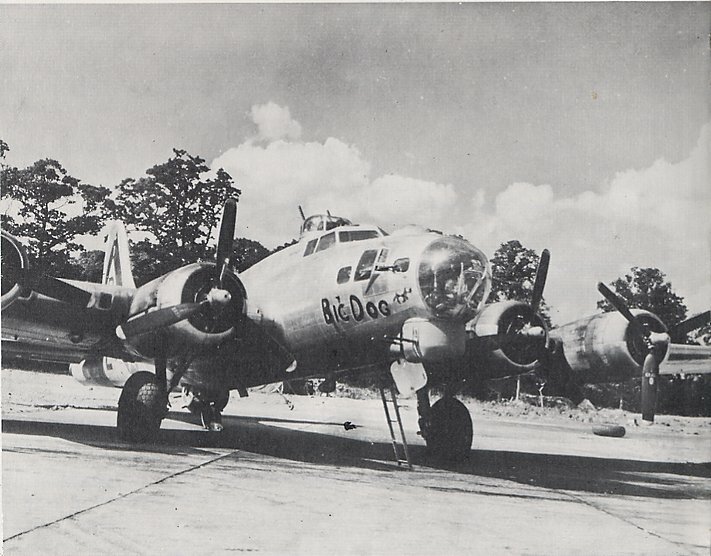 On April 22, 1945 he completed his tour with the 544th Bomb Squad of the 384th Bombardment Group of the 8th Air Force and returned to the states. After WWII he married Virginia S. (maiden name unknown). Public records show them as married and living together between 1952 and 1958, although I cannot find record of their exact marriage dates. On July 1, 1961, Erwin married Bessie Irene Allen in Elmira. Bessie died on October 12, 1994. Erwin’s mother, Mary, outlived her son and died July 16, 1989, at the age of 91 in Syracuse, New York. Erwin died at the age of 61 on June 30, 1981 in Horseheads (Chemung County), New York and is buried in the Maple Grove Cemetery in Horseheads.